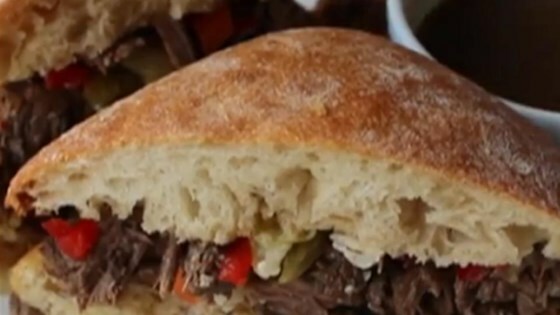 "I tried to combine the traditional Italian beef sandwich with the French dip sandwich with a little nod to the pulled pork sandwich. Instead of using thinly sliced roast beef, I used stew beef, with apologies to my friends from Chicago." Season beef with a pinch of salt and black pepper. Heat vegetable oil in a heavy pot over high heat. Cook and stir beef in hot oil until browned, 5 to 8 minutes. Stir garlic, vinegar, oregano, 1 1/2 teaspoons salt, thyme, rosemary, 1 teaspoon black pepper, bay leaf, and red pepper flakes into beef. Pour enough chicken broth into beef mixture to cover the meat by 1 inch and bring to a simmer. Cover pot with a lid, reduce heat to low, and simmer until meat is fork-tender, 1 to 1 1/2 hours. Transfer meat with a strainer or slotted spoon to a separate pot; pour about 1/4 cup of meat broth into pot. Use a wooden spoon to gently break meat into smaller chunks. Cover pot with a lid or aluminum foil and keep warm. Skim excess grease from top of broth remaining in the first pot; season with salt and pepper to taste. Cover pot with a lid or aluminum foil and keep broth warm. Lay halves of a roll out on a work surface and spoon 2 to 3 tablespoons meat broth over each half. Top bottom half of roll with a generous portion of meat and a spoonful of pickled vegetables. Place tops on sandwich. Repeat with remaining buns, broth, meat, and pickled vegetables to make 3 more sandwiches. Spoon hot meat broth into ramekins and top each ramekin with 1/2 teaspoon parsley. Serve sandwiches with hot broth for dipping.